Tonight for dinner we had Mexican lasagna that I made in my air fryer! 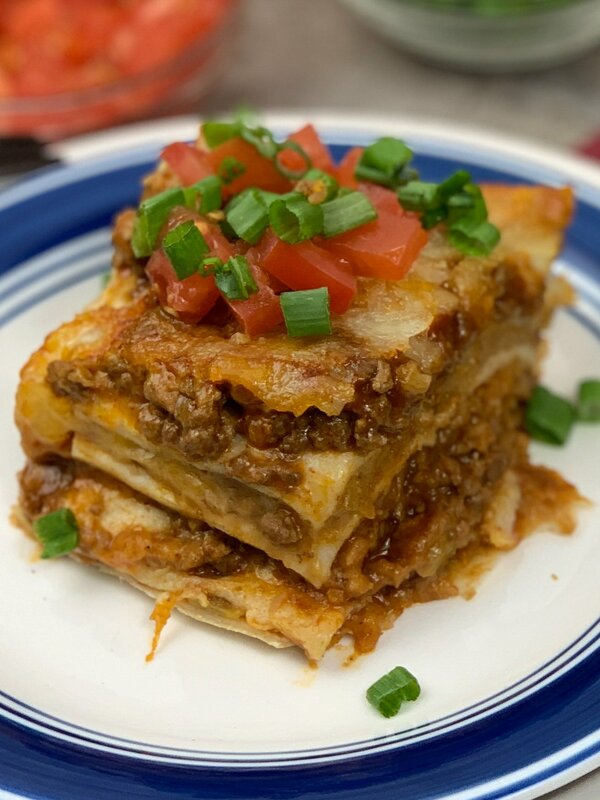 Yall this recipe turned out great, my Mexican lasagna recipe is similar to my Instant Pot Taco Pie Recipe an absolute favorite in my family. 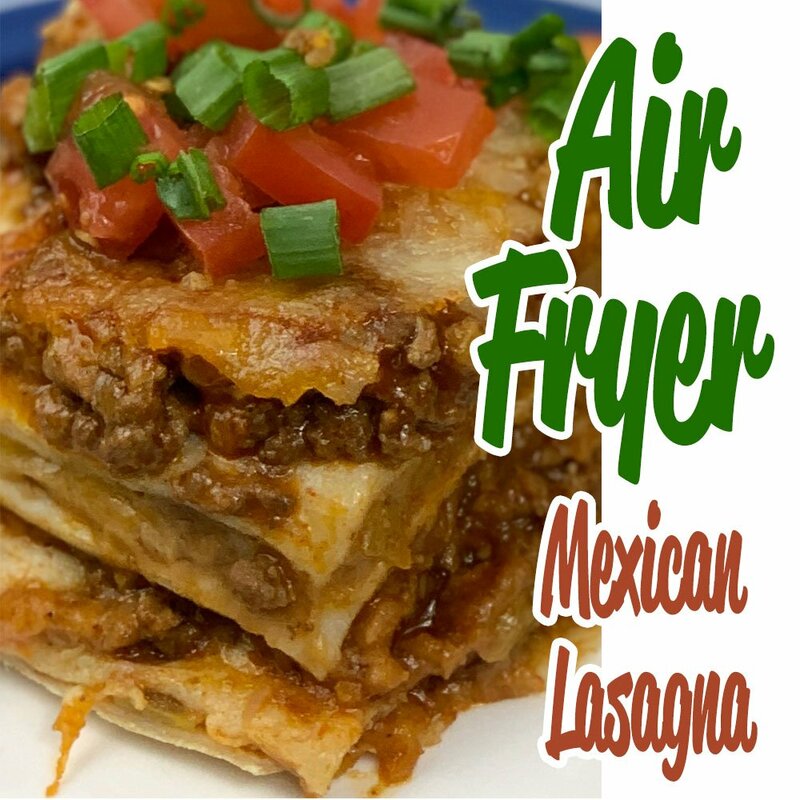 This air fryer Mexican lasagna was really easy and also delicious, and my family loved it. Especially my little one who wants my Taco Pie a few times a week. We love Mexican style dishes in my home, yesterday we had this Mexican Pizza In The Air Fryer which was inspired by the Taco Bell original. My Mexican pizza is with tortillas. But next time I may try it with Doritos or something. 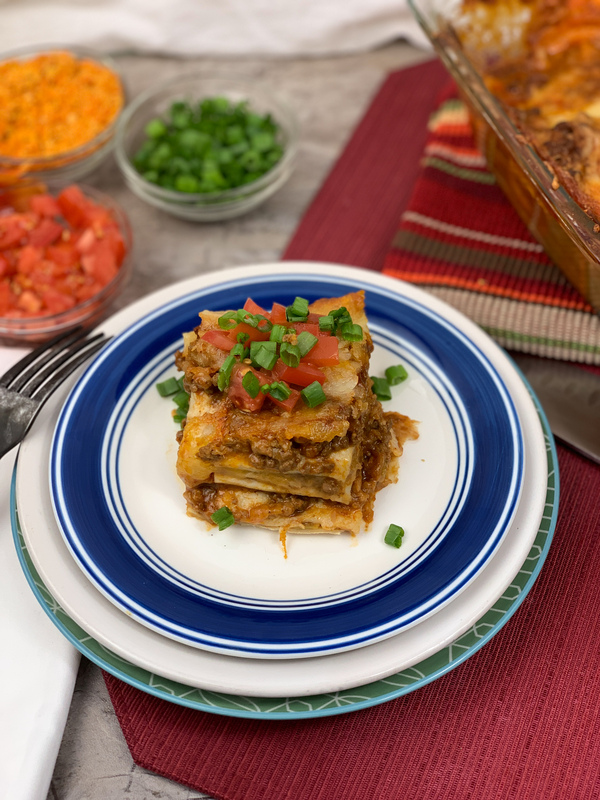 We like to have Mexican lasagna as a stand-alone meal. Sometimes I like to add black beans or corn. But you can also serve as an appetizer or with other Mexican inspired dishes. Like Air Fryer Taco Bell Crunchwrap Recipe or Instant Pot Chicken Burrito Bowl for parties or gatherings like a super bowl party. Can you freeze Mexican lasagna? If you are into meal prepping, this is a great one to make ahead and freeze. You first brown your ground beef, or turkey in a large skillet over medium-high heat, then add in your taco seasoning, I like to use this Homemade Taco Seasoning recipe. You will layer everything, in the same fashion that you would with a lasagna. You’ll repeat layers of flour tortillas, refried beans, cheese, and your meat mixture. You can also add in corn, black beans, and sour cream. I skipped the corn and beans and topped my Mexican lasagna with crushed Doritos and sour cream. Before freezing, allow to cool and cover tightly and place in the freezer for up to 3 months. 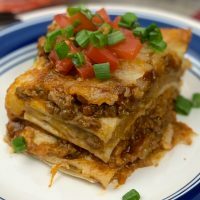 Mexican lasagna is kind of an enchilada casserole or taco casserole. With any of these recipes, you can switch out the beef for chicken, turkey or even pork. You can even use lasagna noodles. There are so many ways you can make this recipe your own. You can use spicy refried beans, add some diced tomatoes. This Mexican Rice would be an amazing addition too. I am really enjoying my air fryer oven, coming up I have a recipe for fruit roll-ups! And I did these zucchini chips too. If you rode the Instant Pot wave, and you haven’t gotten an Air Fryer, then you want to jump on it! It has been around a while now but it is really taking off now. We had one of the first models and recently I upgraded to the Power Fryer Oven. I love the fact that I can dehydrate in it. I haven’t used the rotisserie function yet but it is on my list for this week. We mix up our dinners with different cultures and flavors and absolutely love using my air fryer and instant pot to make our meals. These gadgets are super convenient for working parents, dinner can be done in a fraction of the time and tasts just as delicious as if you slaved over it. Check out these great recipes too! 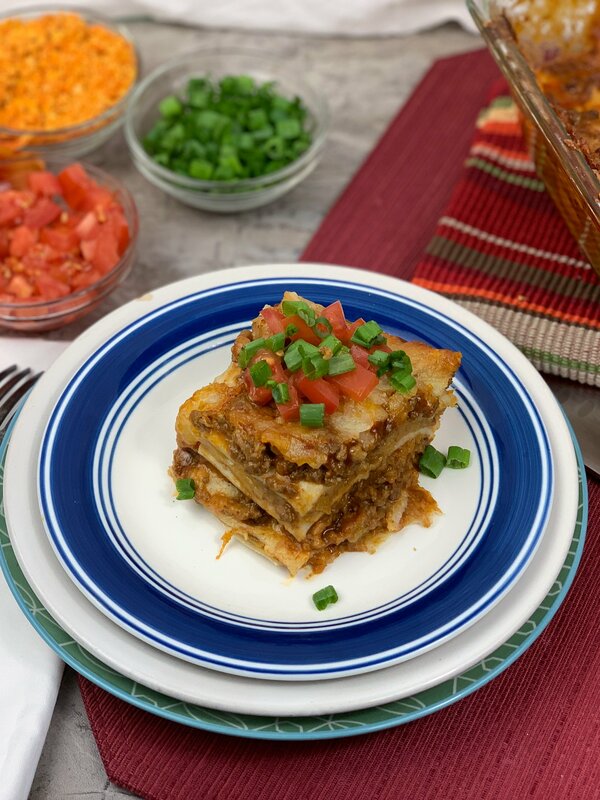 This Mexican Lasagna Recipe is an amazing way to switch up taco Tuesday. 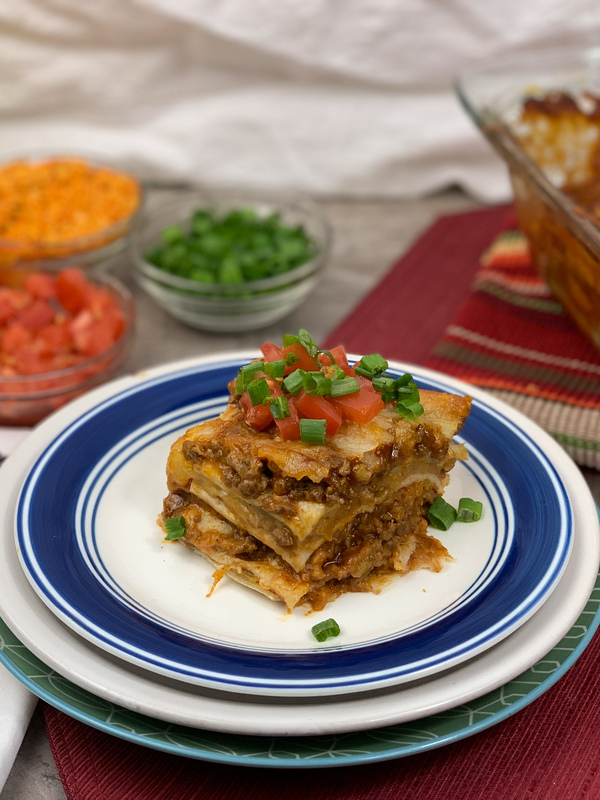 Mexican Lasagna is a great infusion of Mexican spices and flavors that your family will love! Preheat Air Fryer oven to 325°. In a greased 9x9-in. baking dish, cover the bottom with a tortilla, beans then meat mixture. Sprinkle with 1/2 cup of cheese. Repeat until there is nothing left ending with cheese. Bake for about 45 mins until cheese is melted. Top with sour cream, onions, tomatoes and salsa if desired and more cheese. If you don't have an air fryer and want to make this recipe in the oven, pre heat traditional oven to 350 and cook for about an hour until cheese is melted through. This looks so good! I need to expand my air fryer recipes for sure! I have quite a few, and a few more to come. Which model do you have? Really cool recipe. 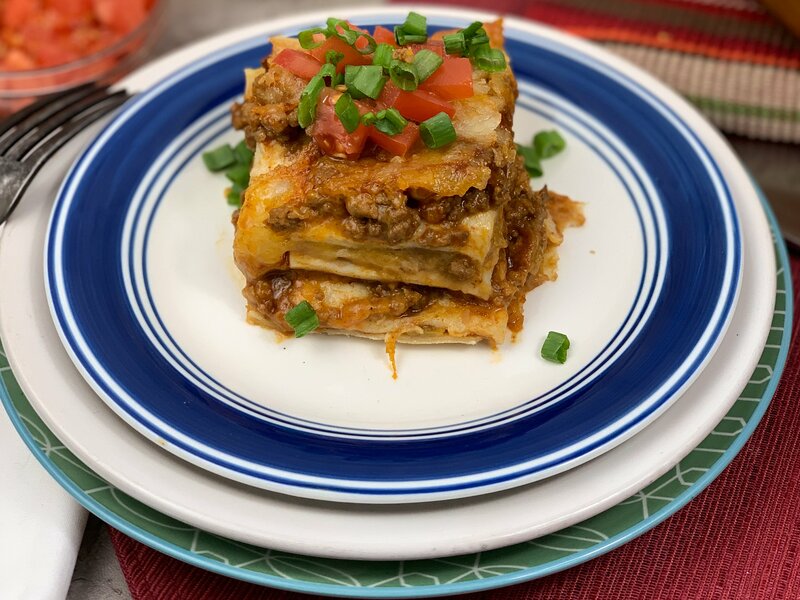 We love our air fryer but had never thought about something like lasagna. Will try this during the week.